PAKISTAN – Multan - The Punjab Auqaf secretary and the Multan commissioner have taken notice of cracks in the wall of the 680-year-old mausoleum of Hazrat Shah Rukn-e-Alam after the archaeology department pointed out that water from two ablution points posed a threat to the historical site. The pre-Mughal era masterpiece can safely be dubbed as the symboland glory of Multan and according to SDO archaeology department Multan Malik Ghulam Muhammad, the east-north portion of the wall near the ablution point (Wuzu Khana) has been affected by salt and cracks in the wall were visible. 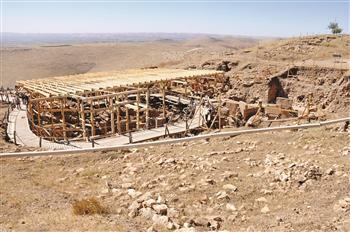 TURQUIE – Göbeklitepe - The new excavation area in Şanlıurfa’s Göbeklitepe, known as the world’s oldest temple, will be covered with a roof for preservation. The head of the excavations, Prof. Klaus Schmidt said they had found new artifacts during their work, which is still continuing, and their work focuses on the area where the preservation roof will be constructed. USA – Boston - But New Hampshire has ancient history, too, when you consider Native Americans, and it has some history not quite that old, but still significant and equally interesting. One of the most important such places is the site of Temple Glassworks. Founded in 1780, it was the first glass-making company north of Boston. The company was founded by Boston entrepreneur Robert Hewes. It lasted two years, and not a great deal is known about it. When the site was abandoned, the trees grew back, and it was largely forgotten by everybody but a few local people. There were stories, of course, some exaggerated and perhaps fanciful, and many families had pieces of glass from the site.On a recent perfect September Saturday, the Historical Society invited the public to the newly protected site and to listen to Starbuck talk about the history, his adventures during the four years of excavations and to dispel a few of the myths that had grown up around it. In spite of the research, he said, a great deal isn’t known and probably never will be. About 40 people made the trek up Kidder Mountain to look at the collapsing stone walls that had once supported the glass house, furnace and ovens. They looked at the foundations of workers’ cabins and peered into what had been the well, and some tried their hand at digging, sifting the excavated soil in wire screens looking for glass shards and maybe an old button. The site is one of the few early industrial sites available for excavation, Starbuck said.The glassblowers were probably German immigrants, but not the Hessian deserters from the Revolutionary War Battle of Saratoga, as claimed by legend. Hewes wrote that he had glassmakers working for him in Boston at his slaughterhouse and tannery. Hewes dabbled in many occupations. The glasshouse burned and was rebuilt. It was at least 69 feet by 67 feet, and surrounded the furnace and crucible where the glass was made. All that remains intact is part of the north wall. The site is now protected, tightly fenced and secured. ROYAUME UNI - Amesbury -A group of archaeologists is undertaking a major dig in Wiltshire, which it is hoped could explain why Stonehenge was built where it was. The team, which comprises of leading experts in the Mesolithic period, also hopes to confirm Amesbury as the oldest continuous settlement in the UK. The site already boasts the biggest collection of flints and cooked animal bones in north-western Europe. The dig in Amesbury will run until 25 October. Andy Rhind-Tutt from Amesbury Museum said Amesbury pre-dated Stonehenge by as much 5,000 years, and could "go a long way" to explaining why Stonehenge is where it is. "No-one would have built Stonehenge without there being something really special about the area. "There must have been something there beforehand and Amesbury may well be it - [it could be] one of the greatest Mesolithic sites in the country." Mr Rhind-Tutt said the team would also be looking to "find evidence of settlement for 10,000 BC". "In previous excavations, they've found evidence of settlement up to 7,596 BC - a boar's tusk - but we're not at the bottom of the trench yet. "Thatcham near Newbury [in Berkshire] is proving to be the oldest continuous settlement in the UK, but if Amesbury has older evidence this time, then it will be instead. "At the moment, it is only 104 years short of being the oldest." Well-preserved remains of a Mesolithic settlement dating from 7,700 BC have previously been found at Thatcham, which is 41 miles (66km) from Amesbury.